Fall Aster is one of the last flowers to bloom in the fall, putting on a grand display of flowers when all of the others are finished. The Greek meaning of Aster is “star” which describes the beautiful 1” blue flowers and yellow disk of this Texas Native. This Aster has two types of slightly pubescent, aromatic leaves; long and broad at the base and reducing in size at the tips. Aster oblongifolius has a tendency to loose it’s lower leaves as it ages, however, giving it a trim when new growth appears will force the leaves down. Not only is the Aster beautiful, it is beneficial to wildlife as wild turkey and other gamebirds will eat the seeds and foliage in the winter. It is also a nectar source for butterflies and bees. 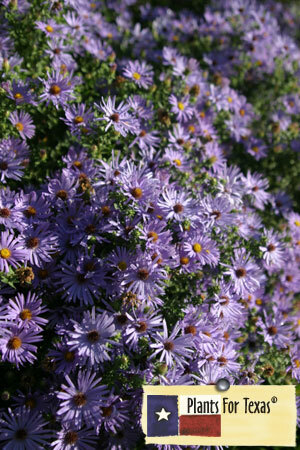 Asters are tolerant of acidic, rocky or sandy soils making it a good selection for coastal plantings. They multiply readily by stolons so you will soon have a mound of Asters 2’ high and 3’ wide. Aster oblongifolius is part of our Plants For Texas® Program, meaning it was Texas Grown, Tested in Texas to perform outstanding for Texas Gardens.